Is 'Water Damage' The New Fire? 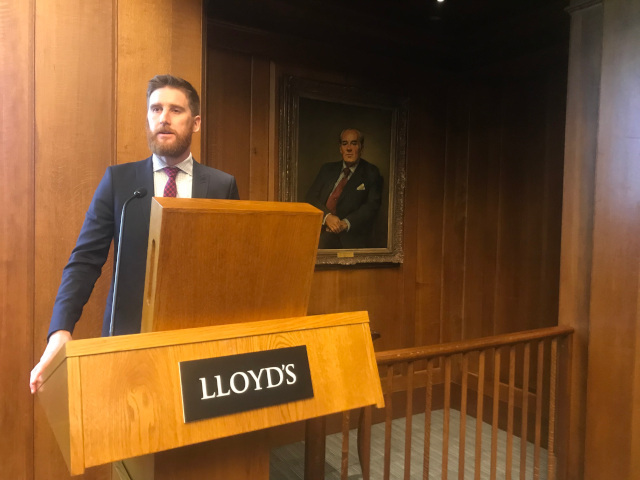 The Insurance Institute of London recently invited forensic engineers Richard Keightley and David Reid Rowland from Hawkins’ London Office to give a lecture at The Old Lloyd’s Library on the current frequency of water damage claims, as well as: what causes them, their prospects for recovery, and how Hawkins can investigate. While David discussed the fact that Escapes of Water are on the rise from incidents in which pipework and plumbing joints have failed, or basement waterproofing defects are identified, Richard (pictured) also discussed damages that have been caused by weather-related flooding incidents, and the likely increase of flood risk in the future. Type A Waterproofing involves the application of a barrier, or liner, to either the internal or external surface of a building - otherwise known as tanking. The effectiveness, of course, relies on the integrity of the barrier used. Type B Waterproofing uses water-resistant concrete to build the walls and floors of the structure. Sections of the walls and floors are often cast at different times, however, so there can be gaps or cracks between them. Type C Waterproofing involves the fitting of a dimpled plastic membrane over the internal surfaces of the walls and floors of a building to create a cavity; if any water passes through externals walls or floors, it is trapped in the membrane’s dimpling. This system is normally used to supplement Type A or Type B systems. Richard focused on the flood risk in the UK, and explained that, although larger-scale floods are often viewed as natural disasters, this is not always the case (as in the common issue of public sewers backing up into private basements’ drains). The chances of pursuing a recovery are much stronger after a ‘manmade disaster’ than a natural one: a hydrologist can identify the causes and contributing factors, whether these factors are based in waterproofing issues, or on people’s actions or inaction. Richard also clarified the differences between a pumped system and an anti-flooding valve. In normal conditions, a pumped system pumps water over a ‘backflow loop’, while an anti-flooding valve opens and drains via gravity. When the water level in public sewers rises above a property’s basement level, the pump still operates and the backflow loop prevents water from backing up, while the anti-flooding valve shuts to prevent backflow. However, when using a pumped system, the protection of the basement is heavily reliant on the performance of the pump, and the basement is still at risk of flooding if that pump fails. There is also potential flood risk when using an anti‑flooding valve system, because if the valve fails to shut properly, water from the sewer can back up. There are several other possible floodwater entry points in a property, in addition to its basement. Employing a flood-resistant front door can boost a property’s flood resilience, as can mounting a boiler on a wall in a higher floor of a property, separating each floors’ electrical circuits, and raising sockets above flood level. Walls and floors should also be structurally sound enough to hold waterproof coating, so that they do not move or crack under hydrostatic pressure during a flooding event. How much water infiltrated the ground? How much ran off into a nearby river? Were the drains up to standard, or was there a blockage? Was there inappropriate development in the area’s floodplain? If you would like to schedule a presentation from an engineer or hydrologist at your office, please get in touch.